A web-based group travel software application, GroupMinder functions both as an in-house and online reservation system. The in-house, or Intranet, component manages customer, vendor, and reservations data that are input by your agents, while the online, or Internet, component allows your customers to independently book travel packages from your website. The Intranet, which forms the functional core of the system, makes it possible for your company to efficiently manage its customers and vendors by enabling users to create and send e-brochures; make and modify reservations; process payments; e-mail acknowledgments; and generate reports — all in a straightforward manner. The Internet component, through the fusion of GroupMinder's reservation system with your company's web site, allows prospective customers to view and book travel packages on-line. A clean, crisp presentation — complete with page-by-page instructions and pop-up boxes that highlight package features — creates an easy-to-follow booking format, which in turn, produces immediate efficiencies for your company. Namely, clients can reserve a travel package, have their credit card processed, and receive an instant acknowledgment... all with no intervention from your staff. GroupMinder stores and tracks detailed client information for both households and individual household members. This includes multiple addresses and phone numbers, personal data (birth dates, anniversary, etc. ), credit card information, personal preferences (non-smoking room, window seat), travel interests, mailing history, trip history, and much more. GroupMinder also stores and tracks detailed vendor and individual contact information, including, name, address, phone numbers, fax, e-mail and web site address. An interaction log allows you to track all your company’s communication with each vendor contact. Most importantly, the vendor database keeps a product history for each of your vendors. The system records detailed information about products purchased, including product type, dates of use, quantity, cost,	and commission structure. 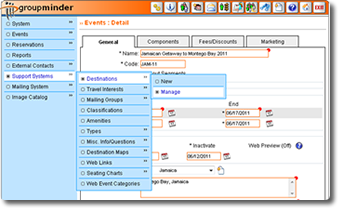 By interfacing with the client database, GroupMinder's mailing system serves as a powerful marketing tool, allowing you to use stored information about customer travel interests, organization affiliations, geographical location, and travel history to do targeted print and electronic mailings with a simple click of the mouse. GroupMinder's easy-to-use reservation system automatically prompts and advances your agents through the booking process of a new reservation screen by screen, thereby minimizing input error. Upon completion of the booking, agents can instantly confirm clients' reservations via email, or generate a printed acknowledgement. Modification of a reservation requires just one click that takes agents directly to the appropriate screen. Even when an entire reservation requires modification, i.e. adding another participant or changing package selection, the procedure is quite simple. GroupMinder maintains inventory control on all package components, displaying real-time product availability throughout the booking process. Further, when inventory is depleted, a product no longer appears for sale, thus eliminating the possibility of overselling your inventory. After completing a reservation, agents can process a credit card payment through the booking system, confirming approval while the client is on the phone. GroupMinder features over thirty reports, all with various sorting options, allowing you to access the information you need for vendors, accounting, and on-site operations. Reports include: Booking Source, Daily Receipts, Customer Payment Detail, Revenue, Balance Due, Hotel Reconciliation, Participant Master List, Name Badge List, Rooming List, Transportation Manifest, Transportation Manifest by Departure City, Optional Tours Manifest, Package Components Inventory, Room Inventory, Transportation Inventory, Hotel Vouchers, Tickets List, Ticket Labels, Tour Packet Labels, Mailing Labels, Shipping Labels, and others. Because GroupMinder is web-based, you can easily provide an affiliate third party, whether a travel agency, social club, or association, access to select areas of your system through what's called the Extranet. By allowing them to view data and run reports, your "travel partners" have access to real-time information on joint projects — and, with no intervention on the part of your staff. The Extranet also opens the way for providing your partner clients or membership with the convenience of online registration via their own web sites. GroupMinder can be set up in just a matter of hours, even at multiple company sites — and, with no special hardware requirements. Just get online, and GroupMinder is at your fingertips — for use at the office, home or an on-site venue. What are my system options? GMbasic - Forms the internal core of the system and enables you to collect and store customer profiles, send marketing e-mails, enter and manage reservations, process credit card payments and run reports. GMplus - In addition to all of the GMbasic features, you'll get the web booking engine that allows your customers to: seamlessly move from your company web site to groupminder's booking pages; make a reservation; enter a payment and receive an e-mail confirmation. Choose a monthly payment plan based on your average number of annual travelers. NOTE: If you exceed the Annual Traveler allotment for your selected plan, an additional fee of $3 per traveler will apply. Some restrictions may apply. Large or complex operations with more than 10,000 travelers per year, more than ten branch offices and/or multiple brands may require custom pricing. All prices are subject to change without notice. The GroupMinder Application has been developed using the latest programming languages and platform protocols. Initially developed by Allaire, ColdFusion is a Web server language that has become the industry standard for web-based applications. As a “tag-based” language with HTML-like characteristics, ColdFusion is especially well suited for the Web application environment. Most significantly, its versatility has led to marked reductions in development time. ColdFusion’s latest release, 2016, marketed under Adobe, has led to improved server response and speed. SQL (Structured Query Language) is the industry standard programming language for database management and data manipulation. The use of SQL allows for extremely fast and flawless communication with the databases that store the information for the GroupMinder application. XML (Extended Markup Language) enables the definition, transmission, validation, and interpretation of data between applications and organizations. XML simplifies maintenance and management of complex data structures, allowing intricate processes to be carried out and completed with minimal database interaction. XML further allows for the storage of data in complex, relational database-table-like structures that enable multi-step functions (such as making and managing a reservation) to be carried out without storing temporary data in the database. The use of XML in GroupMinder balances the load that multi-step, complex processes place on the system. XSLT is a specific kind of template processor primarily designed to transform or format XML documents. The XML document is not changed, it is rather formatted by XSLT rules to display in a multitude of formats such as a text document, a simple HTML document, a complex HTML document that allows data management, or even a PDF document. The use of XML with XSLT allows GroupMinder to exchange smaller packages between the server and the client browser, and to move some of the data formatting and processing to the client machine improving overall application speed. A standard client-side language that is supported by most browser platforms, Java Script is used extensively for validation and data integrity. Java’s speed enables GroupMinder to both run faster and be more interactive than applications built and based exclusively on server-side functionality. Used extensively to provide layout and organization of content in pages, HTML also provides page elements that allow users to interact with the application and the databases. The most obvious reason for using Ajax is an improvement to the user experience. Pages using Ajax behave more like a standalone application than a typical web page. Clicking on links that cause the entire page to refresh feels like a "heavy" operation. With Ajax, the page often can be updated dynamically, allowing a faster response to the user's interaction. Connected through 6 different Tier 1 connectivity providers on a multi-homed, redundant network featuring Gigabit and OCx Internet connections. Data is backed up nightly to an automated tape library that can handle over 5 terabytes of data. Hostek.com employs advanced power systems to insure the continuous operation of GroupMinder's servers. Our entire power distribution system is designed for maximum redundancy including diesel power generators, central Powerware UPS, and K-Rated transformers. To gain access to the equipment within the data center, a person must swipe an electromagnetic access card to enter the building, provide a personal password, scan his or her hand through a scanner, and unlock the appropriate cabinet with a key. All access inside and outside the data center is monitored 24x7x365. In addition to monitoring the movement of people throughout the data center, we monitor our equipment, network utilization, latency, packet loss, and service availability at the Network Operations Center (NOC). Response to problems is immediate so that service is uninterrupted. GroupMinder uses two cloud high availability servers, one for hosting the application (“application server”) and the other for database storage (“database server”). This separation helps minimize server load and shorten response time. The servers have been optimized to accommodate periods of high resource demand. Both servers run Microsoft Windows 2012 R2 64-bit “Advanced Server.” Additional applications have been limited to ensure maximum reliability and minimum conflicts (ColdFusion 2016 to the “application” server and MS SQL Server 2014 to the “database server”). In order to shorten download times, both portals have been designed with a minimum of graphical embellishments. Client computers accessing these portals should use a major browser (IE, Chrome, FireFox, Safari). Browser cannot be more than one generation old. All major browsers (IE, Chrome, FireFox, Safari) can be used. Browser should not be more than one generation old. For its database platform, GroupMinder uses Microsoft SQL Server 2016 Standard edition, a powerful database system that maximizes system availability, scalability, speed and security. With around-the-clock availability essential, SQL Server was developed to provide the highest level of dependability. DELL, among other companies that rely heavily on SQL, has reported 99.9985 percent availability for an entire year. Microsoft SQL Server 2014 Standard Edition scales up to 128 gigabytes (GB) of RAM and up to 24 cores. This can be used in conjunction with scale-out techniques, such as Distributed Partitioned Views, to handle the largest data sets and transactional loads. Currently, the world’s fastest database, “SQL Server ” can handle up to 688,220 transactions per minute! On the TPC-C performance list, SQL Server holds the number one position, four of the top five, and five of the top 10 results. SQL Server installs with a high level of security by default, taking advantage of Microsoft Windows® 2012 R2 integrated security. “Server ” also possesses sophisticated security features that include powerful and flexible “role-based” security for server, database, and application profiles; integrated tools for security auditing; and support for complex file and network encryption. GroupMinder is accessible from any Web terminal in the world. This allows authorized users of the application to carry out their assigned functions from multiple locations without costly setups or geographically imposed limitations. This feature also allows multiple offices or branches to interact with ease and to draw data from a central, live, and always up-to-date location. GroupMinder code is streamlined to produce files that are as small as possible and that download quickly. In addition, as many database interactions as possible have been converted into “SQL Stored Procedures” to both minimize the load on the Database servers and to reduce query-processing time. All data integrity functions have also been converted into Foreign-Key constraints and Triggers witch are faster and more reliable than page-coded business rules. All graphics used to enhance Groupminder’s navigation and user interface have been manipulated and reduced to the smallest possible file size. This results in faster loading pages. To ensure reliability, GroupMinder has been extensively tested using real-time data and performance load scenarios. By using only proven, mainstream technologies together with components that integrate seamlessly, GroupMinder functions well even in extreme, high demand situations. GroupMinder uses all non-proprietary, plus some publicly unavailable methods to speed up and diminish server load, helping to maximize both server and system up-time. GroupMinder components have been developed and organized with parallelism in mind. Once a user becomes familiar with a single component, all other components then become simultaneously familiar. As a result, users require only minimal training to productively carry out their tasks. Consistency is paramount to ease of use. All error, confirmation, and notification messages have the same format and are displayed in the same location. Special attention has been paid to establishing a consistent nomenclature for all GroupMinder components. GroupMinder uses proprietary technology that allows multiple users to be created in the system. Users can be assigned rights based on their needs and functions. The system uses an audit feature to log actions by all users. Administrators can consult the audit log to search for specific actions and any misuses of the system. All delete functions require confirmation to prevent accidental deletion of any data. System administrators can further enhance the security of the system by requiring minimum character lengths for usernames and passwords and also by configuring the system to periodically expire user passwords. The system automatically prevents the user from reusing passwords and also prevents multiple users from using a single username password combination. A 64-bit key, unique to each client, serves to encrypt all sensitive information stored in the database, thereby rendering the data unusable through any unauthorized access. Data transferred between client computers and application or database servers is channeled through 128 bit SSL connections. Thus, if the data were to be intercepted by unauthorized individuals, it would be encrypted and therefore unusable. GroupMinder has been programmed in a shared component format. Pages that carry out similar functions share components (ColdFusion Custom Tags & ColdFusion Components). Modifying a function requires changing only a single component. All pages using that function will then automatically have access to the updated version of the component. The application has been mapped in easy-to-follow flow charts that facilitate construction, understanding and problem solving, while carefully commented programming allows code to be easily understood by other developers. GroupMinder is designed with the following disaster precautions and disaster recovery measures in mind. The application is served from high availability servers that are over-engineered to withstand the highest loads. Redundant components, including mirrored hard drives, redundant network cards and redundant power supplies are used to help guard against component failure. Three-tier architecture is used for load balancing of complex processes. All code is written to make efficient use of the most available computing resources. All servers are co-located at a “Cisco Certified” data center that meets the highest security and availability standards. On-site, nightly backups are implemented for all data. Additional off-site, nightly backup is available for a nominal fee upon request through the resources of GroupTravelTechnologies.